Recently I had the pleasure of studying a new TOE (Theory of Everything) called CPH which has been proposed by an Iranian physicist by the name of Hossein Javadi (1). Mr. Javadi's theory reminds me of Leibniz's Monadology, a model of the world with a tilt to pluralism (2). Leibniz's pluralism is closer to the pluralism of atomists (from Democritus to Russell), than to the pluralism of Aristotle. "...[For Aristotle,] there is a hierarchy of concepts that refers to concrete things and in the order of explanation, the universals are first and particulars are last, whereas in the order of sensation, the particulars come first and universals are the last. In the order of sensation, the most fundamental concept is substance which is followed by the concepts of unity (or being) and first principles. In the order of explanation, it is the opposite and first principles are the primary concepts followed by unity (or being) and substance...To discover whether plurality or unity are primary in Aristotle’s metaphysics, we should ask which one is prior in the order of sensation, because Aristotle, in all his philosophy, gives primacy to the sensible things rather than to the abstract ideas...Aristotle writes in his Physics “The universal is more knowable in the order of explanation, the particular in the order of sense [Book I, 189a 5-10, BW, p.228].” Based on the two interpretations of Aristotle’s metaphysics in this paper, plurality is next to particulars and unity is next to the universals. Therefore, plurality has primacy in the world as it is, and unity has primacy in our ideas and explanations. In other words, unity is the farthest from the perceptive reality and may be even subjective, and plurality is the closest to the perceptive reality and is the state of objective reality. Thus I can conclude that pluralism is what is defended in Aristotle’s Metaphysics, though as I explained, with all the intricacies of Aristotle’s unique metaphysical scheme" (3). "...the subjective notion of truth is objectified when he [Bertrand Russell] claims that the truth of the world can be reduced to “facts that make up the truths of the world.” This was very similar to Leibniz’s Monadology where the subjective notion of mind was *objectified* by monads. The atoms relating to the truth in the objective world, according to logical atomism, are not particulars, relations, or qualities; but a unique unity of them corresponds to the truth, i.e. the atomic facts. Thus, these atomic facts, though complex, are not reducible to their parts as if the objectification of truth is a ghost holding them together" (4). It is interesting to remember how Leibniz was so much perturbed with the concept of *action at a distance* in Newton's gravitational theory to the point of ending up in the wicked arguments with Newton. In fact, their fight about calculus was not a difference about theory, but was rather about who invented calculus first, whereas their disputes about action at a distance were their real *disagreements* which were even raised to a theological dispute. Javadi is also trying to answer the issue of action at a distance by his theory of transformation of the vector quantity force and the scalar quantity energy, when he shows a quantum of work can be defined by a quantum of force multiplied by Planck's Length (Wq=Fg.Lp). Thus just like Leibniz, for Javadi, there is no action at a distance, and the space is filled with gravitons, that interact with each other. For Javadi, the gravitons are nothing but the CPH when it has a spin, and CPH (Creation Particle Higgs) is the basic particle of the world with constant mass moving at constant speed in an inertial frame. In other words, the whole world is a simple five dimensional world (spin is considered a dimension). Javadi's model, not only explains the inconsistencies of quantum mechanics and relativistic theory, it even explains classical issues better than the 10-dimensional model of string theory. For example, force being a vector quantity, means that the conservation of momentum conserves in all three physical directions at the same time, whereas mass and energy being scalar quantities, means the conservation of mass and energy conserve one-dimensionally, at least when dealing with them in classical mechanics. Javadi's model, through the transformation of force and energy, makes these fundamental concepts of physics identical. Eventually the CPH Theory, makes the main challenge of modern physics, the unification of the three forces of nature possible. "One purpose that has run through all that I have said, has been the justification of analysis, i.e. the justification of logical atomism, of the view that you can get down in theory, if not in practice, to ultimate simple, out of which the world is built, and that those simples have a kind of reality not belonging to anything else [Russell, Bertrand, The Philosophy of Logical Atomism, LK, p. 270]." 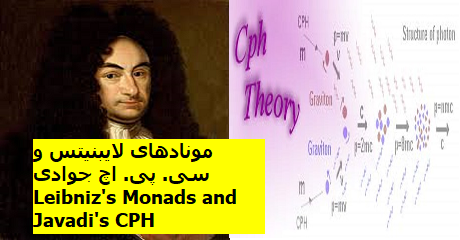 Below I present my own analysis of Leibniz's Monadology, from the viewpoint of philosophy of science, hoping that while the discussions of CPH theory continue in the physics community, I can help similar discussions about the philosophical model of CPH theory to start in the circles of philosophy of science [http://www.ghandchi.com/358-falsafehElmEng.htm]. In the opening of "Principles of Nature and Grace" [Leibniz, G.W., Philosophical Papers and Letters, Leroy Loemkev Edition, University of Chicago, 1956, Vol. II, p.1033-4], Leibniz defines ‘substance’ in a Cartesian style as ‘a being capable of action;’ and ‘simple substance’ as ‘that which has no parts.’ Then Monads are introduced as equivalent to ‘simple substances’ and he continues by asserting “Monas is a Greek word signifying unity or that which is one.’ Plato refers to Mind as *the* Monad [Aristotle, De Anima, The Basic Works of Aristotle, Richard Mc Keon Edition, 1941, P.540] and most commentators think that Leibniz, contrary to Plato, Aristotle, and Descartes (his principle inspirers), has actually made mind divisible in his metaphysic and has presumed its parts as Monads. Thus, it is believed that the nature of Monads is mental. On the other hand, Leibniz’s referring to Monads as ‘true Atoms of nature’ [Leibniz, Monadology, George Montgomery's Translation, Open Court Publ, Illinois, 1980, P.251] bears a certain resemblance to ancient Greek atomism. Nevertheless, most commentators agree that Leibniz’s Monads differ from the atomists’ atoms insofar as the former do not embody extension whereas the latter do, i.e. the Monads are not geometrical points and are metaphysical points [Copleston, Frederick, A History of Philosophy, Vol. IV, The Newman Press, Maryland, 1960, P.266]. Therefore, despite the undeniable resemblance of Monadology to atomism is undeniable, the nature of these "atoms" (i.e. the Monads) remains to be investigated separately and I will do this scrutiny in the following lines. Revealing the differences and similarities of Leibniz' s Monads with Plato’s Forms, Aristotle’s substances, and Descartes' simple substances is not enough to fathom the nature of Monads. Various commentators stressing the different qualities of Monads alleged in Leibniz’s numerous works have mostly proposed these elements to be mental and some even believed them to be material elements. In my opinion, the problem of these commentators is that they are limited to the framework of Western philosophy in which ultimate reduction is either mental or material and this fact has been the reason for futile attempts to classify Leibniz as an idealist or a materialist. Although Leibniz was essentially familiar with Western philosophy and certainly Plato, Aristotle, and Descartes had great influence on his thought, nonetheless his speculations about the nature of simple substances (Monads), is unique and in a sense resembles some of the Eastern philosophies. I think it is evident from the book Monadology that Monads are the basic blocks or the atoms of the world. That this reductionism was accepted by Leibniz can be gathered from his presumption of the world to have ‘true atoms.’ Thus, the question is what is the nature of his reductionism-is it materialist, idealist, or is it something else? Materialists reduce all reality to some kind of material principle and synthesize the world from this principle, e.g. some of the modern atomists presume the atomic particles (or sub-atomic particles) as the basic blocks of the world and biological elements (like DNA or RNA) or mental elements (neurons) are assumed to be ultimately comprised of material sub-atomic particles (i.e. electrons, mesons, etc.). The idealists reduce all reality to some kind of mental principle and synthesize the world from this principle, e.g. the subjective idealists consider everything to be in our mind and some quantum physicists similarly believe that the existence of electrons depends on our thought. The foregoing may be regarded as a brief sketch of materialism and idealism in Modern philosophy and science. In the East, especially in Indian philosophy (e.g. Vedanta philosophical systems), there is another kind of reductionism, almost unbeknownst to Western concepts, which we may call biological reductionism. In this thought, the ultimate biological elements are not molecules of ultimate material elements. Instead, the ultimate material elements (e.g. electrons) are comprised of ultimate biological elements (whatever they may be called). From such a perspective, electrons are even more "biologically" ultimate than RNA/DNA, and still the ultimate biological elements are to be found in the elements comprising electrons, in short the ultimate biological element are the building blocks of even the electron and sub-atomic particles. Probably, if we would like to express such an ideology today, the best word for the ultimate element would still be Entelechy, the word that Leibniz used interchangeably for Monad. "Every portion of matter may be conceived as like a garden full of plants, and like a pond full of fish. But every branch of a plant, every member of an animal, and every drop of the fluids within it, is also such a garden or such a pond [Leibniz, G.W., Monadology, Ibid., P.266]." "If we wish to designate as soul everything which has perceptions and desires in the general sense that I have just explained, all simple substances or created Monads could be called souls. But since feeling is something more than a mere perception I think that the general name of Monad or Entelechy should suffice for simple substances which have only perception while we may reserve the term Soul for those whose perception is more distinct and accompanied by memory [Ibid., P.255]." "I believe, therefore, that if the animal never actually commences in nature, no more does it by natural means come to an end. Not only is there no generation, but also there is no entire destruction or absolute death [Ibid., P.268]." The biological nature of Monads makes their essential qualities to be *apperception* and *appetition* and even motion itself [Leibniz, G.W., Principles of Nature and Grace, Philosophical Papers and Letters, Vol. II, P.1034-36]. Moreover, their relations are not by efficient causes (monads are ‘windowless’) and they are related by final causes. This is why he considers final causes as the principle of efficient causes and gives priority to final causes [Ibid., P. 1040]. His God is *not* the Unifier but rather the Harmonizer of the world of Monads. Even this concept in Leibniz, which separates him from his colleague and contemporary Spinoza, very much approaches some Eastern pantheists’ beliefs in Harmony rather than a Western view of Unity of the world. The views that give primacy to final causes and their refutation by Spinoza have been discussed in detailes in a paper entitled "Spinoza's Refutation of Teleology" (7) and also in an article entitled "Sufism and Fatalism" (8). The intricacies of Leibniz’s metaphysical scheme and its relations to the nature of Monads shows why he arrived at the picture of the world as the "City of God" with a dominant monarch, God, as the ultimate Monad and the Creator of this world.